What is Recycler folder anyway? Is it really part of Windows or not? When you delete a file in Windows NT Explorer or My Computer, the file is stored in the Recycle Bin (if this feature is not turned off). The file remains in the Recycle Bin until you empty the Recycle Bin or restore the file. The Recycler folder is used only on NTFS partitions. 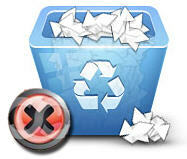 The RECYCLER folder is the recycle bin for every drive that has read/write capability. Naturally CDROM won’t have that. Saying another way, the Recycle Bin on your desktop is simply a shortcut to all the RECYCLER folders in your computer. If you have a C: and D: drives on your unit which is of read/write capability (harddrives, USB Mass Storage Devices); then your recycle bin shows the contents of C:RECYCLER and D:RECYCLER. Having these RECYCLER folders on each drive saves the OS from having to physically move/copy a deleted file or folder into one fixed location which maybe on another drive. Needless to say, retaining an individual RECYCLER folder for each drive is way much reasonable, easier and faster. Now, why in the heck would I want to “Remove Recycler Folder?” as the title suggests? First of all, I seldom need them. Most of the time I turn it off, though I am not advicing you guys and gals to do the same. When I delete something on my unit, it is meant to be deleted not simply moved. I hate pressing Shift+Delete (shortcut to bypass moving to Recycle bin of deleted items) whenever I really intended to delete something. So, like I said, I turn this feature off. Second is a lot of viruses uses and abuses this folder now. They lurk inside and thus sometimes fools the OS and anti-viruses. I have several brunch with different viruses where when traced points out in a file inside the folder named RECYCLER. So for me, since I don’t use the recycle bin feature, and since I hate repeatedly cleaning RECYCLER folder, I would rather this be removed. Sometimes, RECYCLER FOLDER is also in use by the OS so there will be locks on that. Unlocker will take care of those locks. Can you delete the RECYCLER folder without unlocking the processing first? In some rare occasions involving other tricks, yes you can. However, it is safer to remove any of the OS locks before you do that. And also, you should turn off first its ability to hold the deleted files and folders. Right-click Recycle Bin, Tick "Do not move files to the Recycle Bin". Now use unlocker and delete said folders. One thing you will notice, especially if there is an unkown/undetected virus in your unit that utilize this folder to spread itself (sometimes check autorun.inf using Notepad and in some cases you will see it is pointing inside RECYCLER folder), even with the locks removed, said folder is immediately recreated. How to really delete it then? a. Use unlocker but instead of deleting said folder, choose RENAME option. Then rename it like RECYCLER2. Hit “Kill Process” and “Unlock All” buttons. b. Once renaming is successful, create a new text file and rename it recycler (without extension txt or any other). For this to be successful, ensure that the extensions are shown via Folder Options, View Tab, Untick “Hide extensions for known file types”. c. Right-click on newly created recycler file, choose properties and tick “Read Only” and “Hidden”. Now that file cannot simply be overwritten. d. Choose unlocker again and delete the now named RECYCLER2 folder. And there you are. Any viruses utilizing said folder won’t work anymore because they need to be saved “inside” a folder named RECYCLER which now don’t exists and a folder of that name can’t be easily created because of the existence of a read-only file named the same.